You're an agency and you want to allocate an agreed-upon, fixed amount each month to your client's account. In addition to the daily budget, you can use budget orders on the account level to make sure monthly costs won't exceed that amount. Also, if you're an advertiser who wants to receive separate invoices for each account that you're marketing with AdWords, then you can request a budget order in your account. This allows you to get a separate invoice for the account that you created the budget order for. All information about your budget orders can be found on the Orders page, found by clicking the gear icon and choosing Billing. Click the gear icon and choose Billing. Click the Orders link, then the +Create new budget order button. In the Budget field, select Unlimited if you don't want the total spend for all your AdWords campaigns to be limited to a particular amount. If you'd rather limit your AdWords campaigns spend, select the second option next to Budget and enter your amount. Select a Requested start date and, if applicable, an End date. Enter the Order name and, if you'd like, the Purchase order, Notes, or both. 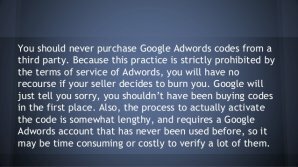 Your account will stop serving ads if your budget is spent or a specific end date is reached. So, check your orders regularly to make sure that your ads continue serving. Click the Orders link. Then find the budget order you'd like to remove, end, or edit. Once you find the budget order, look under the Actions column. To remove a budget order that's pending activation or review, click Remove. To end an active budget order, click End order. To edit a budget order, click Edit. A green menu will appear under the Orders tab with your editing options. You can change your budget, end date, order name, purchase order, or notes. You can then regenerate your invoice and the new, updated details will appear. Just wait two to three hours for the details to update in your account before regenerating the invoice. If you edit an active budget order, or one that's pending activation or review, you'll see this reflected on the table in the Orders tab. Just look at the original budget order in the table; you'll see the requested changes in italics right below. If you click "cancel changes, " the original budget order will stand. If you remove the original budget order, both the budget order and the change request will be removed. Sometimes, your budget order can appear with a green + (plus sign) or a red - (minus sign) preceding it. Here’s what they mean. An amount can appear with a green + (plus symbol) in two situations: either a credit adjustment was applied to your account, or we detected invalid clicks, for which you won't be charged. In both cases, the amount shown after the green + is your additional budget available to spend. Add it to your available budget line to get your total budget to spend. In the case of invalid clicks, our system calculates the amount of your budget that was taken up by invalid clicks. Since you won't be charged for the invalid clicks, the system then adds that amount back to your budget so that you spend what you originally intended. An amount preceded by a red - (minus symbol) is an amount that's not yet available for use. Usually this happens when you've just increased your existing budget order and the increase hasn't been fully processed yet. This budget status is temporary, and you should soon see the notation disappear when the additional budget is added to the available budget line. A budget order acts only as a spend cap. If your account costs reach the designated amount before your set end date, all ads in the account will stop running. A budget order won't distribute your costs across your campaigns or across your specified time span. For that, you need campaign budgets. Let's say you have an AdWords account with two campaigns. You create a budget order for $1, 000 for the period of April 1 to April 30. If your account accrues $1, 000 in costs after April 1st and before April 30th, your ads will stop running until your next budget order starts. You assign campaign #1 a daily budget of $25 and campaign #2 a daily budget of $8.33. The Budget column shows you the total amount that has been requested or approved for a budget order. If the budget order is unlimited - meaning that all your AdWords campaigns aren't limited to a particular amount, but rather the daily budgets that you've set for each campaign - you'll see Unlimited here. The Spend column shows you the total spend so far for a budget order. This number can be higher than the amount listed in the budget column if, for example, a credit was added to your budget order, giving you extra spending money. Below the spend amount, you'll see a horizontal bar that displays what percentage the spend amount represents out of the effective budget. You can filter the table shown below the Orders tab. Just click the drop-down menu in the top corner of the page.